I am back in business after a short vacation period (now and then it happens! ), just in time to publish the second Cyber Attack timeline of March (the first one is here), which confirms the growing trend we have been experiencing in 2015. Two weeks packed with events, started in the worst possible way, with the massive cyber attack against Premera Blue Cross (11 million customers affected), and continued with the same baffling trend, since the list of organizations targeted by massive breaches, includes other primary companies such as British Airways, Slack and Twitch (an Amazon-owned game video streaming service). Two weeks that also saw a sustained DDoS attack against GitHub, the discovery of several campaigns (Operation Woolen-Goldfish, the Trojan.Loziak malware targeting oil and gas companies, and the Volatile Cedar campaign originating in Lebanon), and also an official statement issued by the South Korean government, blaming North Korea for the network intrusions that stole data from Korea Hydro and Nuclear Power (KHNP). 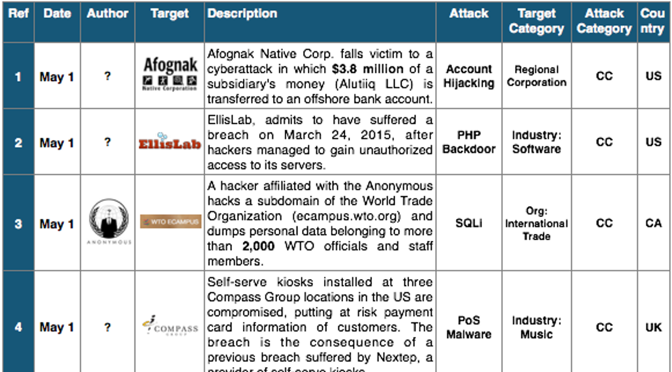 In background, the usual sea of smaller events driven by hacktivism or cybercrime. If you want to have an idea of how fragile our electronic identity is inside the cyberspace, have a look at the timelines of the main Cyber Attacks in 2011, 2012, 2013, 2014 and now 2015 (regularly updated). You may also want to have a look at the Cyber Attack Statistics, and follow @paulsparrows on Twitter for the latest updates.